Prep time: 5 minutes for the pastry & then 15 minutes to assemble the rugelach. Refrigeration time: At least 2 hours for the pastry & then 30 minutes to chill the rugelach before baking. 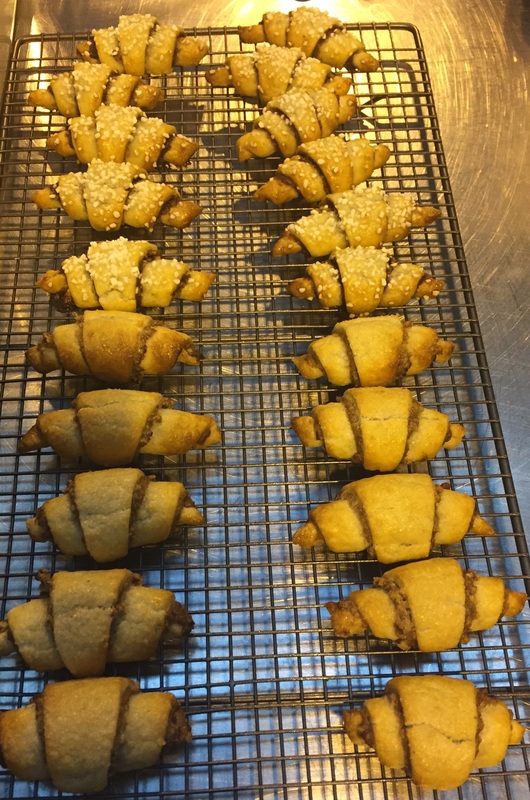 Makes: 16 Breakfast Rugelach & 16 Rocky Road Rugelach. 1) In a food processor beat together the butter and cream cheese until well combined. Add in the salt. 2) Add half of the flour into the food processor and pulse until the flour is all incorporated. 3) Gradually add in the rest of the flour, pulsing the food processor after each addition and stop as soon as the dough has come together. 4) Empty the soft and sticky dough out onto your floured work surface and split it into two roughly evenly sized balls. Wrap the dough balls in cling film and pop them in the fridge for at least 2 hours. (You can make the dough the day before you need it and leave it in the fridge overnight). 5) When you are ready to make the rugelach remove one of the dough balls from the fridge and empty it out on to a well floured surface. 6) Roll the dough in the flour until it is coated and then using a rolling pin, roll out the dough into a circle that’s approximately 20cm in diameter. 7) Mash the banana in a bowl and add in the light brown sugar, cinnamon and speculoos. Mix together until you have a thick paste. 8) Put the pecans in the food processor and pulse until all of the nuts are chopped and there are no big pieces. 9) Using the back of a spoon, spread the banana paste onto the dough circle, leaving a small border all of the way around. 10) Sprinkle the chopped pecans over the top. 11) Using a pizza cutter, cut the dough circle in half, then quarters, then eighths, then sixteenths, so you are left with 16 slices. 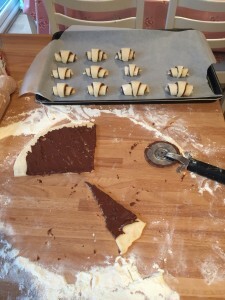 12) Work from the outside in, by rolling the outside edge of one slice into the middle and then place the rolled rugelach point side down, onto a lined baking tray. 13) Place the rugelach in the fridge to chill for 30 minutes. 14) Remove the other dough ball from the fridge and empty it out on to a well floured surface. 15) Roll the dough in the flour until it is coated and then using a rolling pin, roll out the dough into a circle that’s approximately 20cm in diameter. 16) Put the rich teas in the food processor and pulse until all of the biscuits are chopped and there are no big pieces. 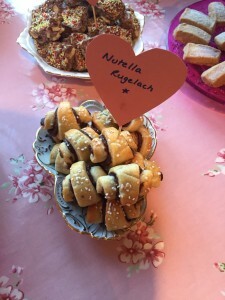 17) Using the back of a spoon, spread the chocolate spread onto the dough circle, leaving a small border all of the way around. 18) Over the top of the chocolate spread sprinkle the crushed biscuits, chocolate chips and puffed rice cereal. 19) Using a pizza cutter, cut the dough circle in half, then quarters, then eighths, then sixteenths, so you are left with 16 slices. 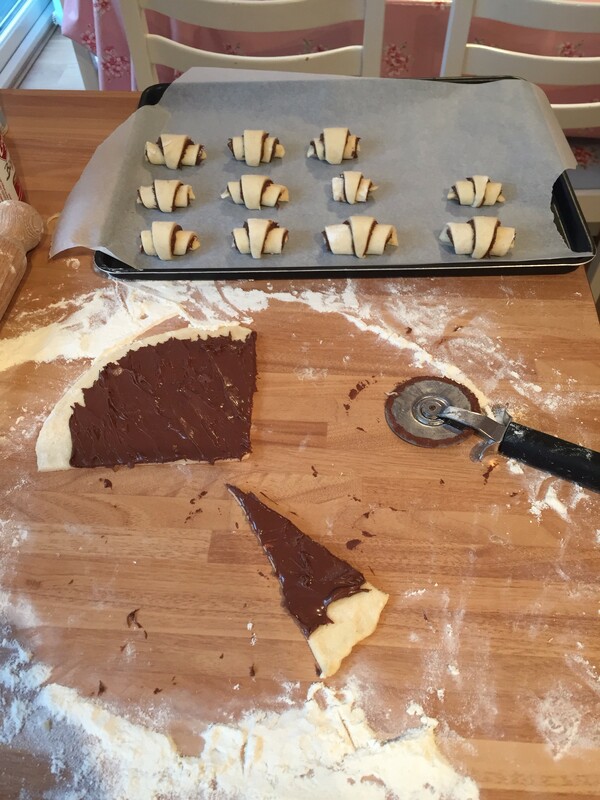 20) Work from the outside in, by rolling the outside edge of one slice into the middle and then place the rolled rugelach point side down, onto a lined baking tray. 21) Place the rugelach in the fridge to chill for 30 minutes. 22) 15 minutes before you are ready to bake, preheat your oven to 190 (170 for fan ovens). 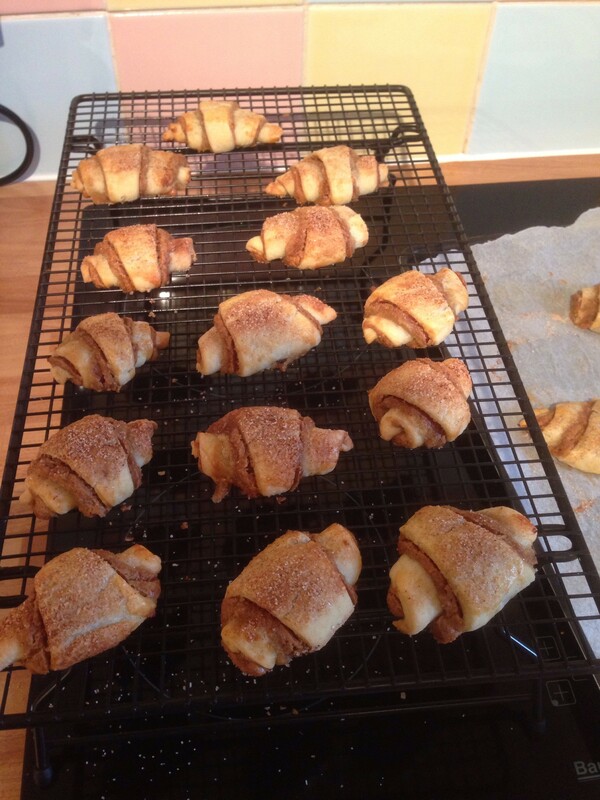 23) After 30 minutes, remove the rugelach from the fridge. Brush them with some beaten egg. 25) Sprinkle the pearl sugar over the rocky road rugelach. Bake the rugelach for 15-20 minutes until light golden brown. Transfer them to a wire rack to cool. These are best eaten on the day they are baked, but they can be stored in an airtight container for up to 3 days.